Just when you feared your overstuffed, eyesore of a closet was a lost cause, here's the antidote to all your closet woes. Closet expert and style maven Melanie Charlton Fascitelli is here to help you whip your closet into shape, refreshing your wardrobe and saving you time along the way. 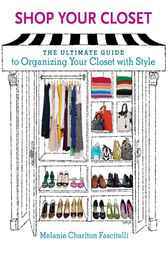 With this accessible, stylish guide, you'll find out how to redo your closet and organize your clothes so that you can, yes, go shopping there—sort through shirts, pants, skirts, dresses, scarves, and shoes, all in perfect condition and ready to go. From the first closet face-off to long-term maintenance, Charlton Fascitelli takes you step by step through the entire process of turning your closet into a "safe haven" for your clothes. Charlton Fascitelli also covers consigning or donating all your old stuff; keeping your closet clean and tidy; packing smartly and efficiently; storing your linens; and organizing other areas of your home, including your medicine cabinet, pantry, or CD collection. Clearing clutter, organizing clothes, and remaking your wardrobe has never been so easy or attainable. Shop Your Closet is your go-to source for closet nirvana.